In the years leading up to and including the American Civil War, coins were at a premium. Folks started hoarding them, or selling them for metal scrap, and they became scarce. Which made it awfully hard for people to make change during day-to-day transactions. So all sorts of methods were developed to cope with the shortage. Some used postage, which eventually led to stuff like Aunt Mary's encased postage coin. Other businesses started minting their own coinage, now known as "Hard Times" or "Civil War" tokens. 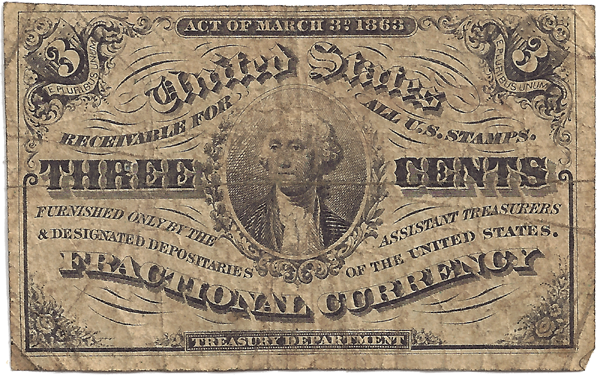 And the the government stepped in with official "Fractional Currency"--tiny little bills, sort of like large postage stamps, to take the place of the missing coins. 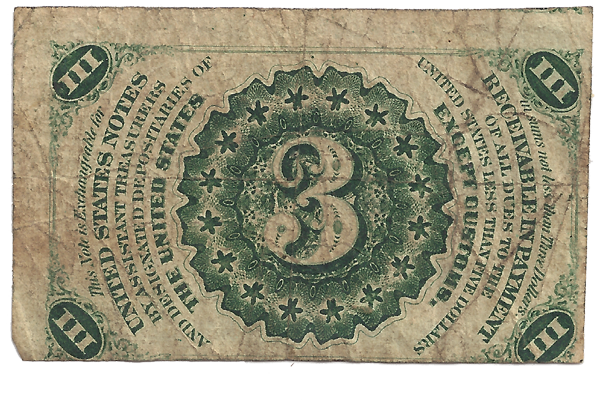 This is a clearly circulated three-cent bill. As you can see, it makes up for its small size and denomination with the ornateness of its design! It sports George Washington on the fronn amidst a whole lotta words, and even more explanatory paragraphs on the back. These fractional currency bills were all hand-cut, so while the front looks centered you can see the way-off margins of the back face.